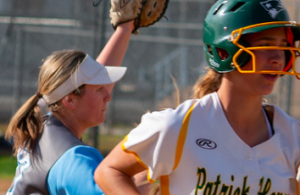 LA MESA (3-23-2019) – The majority of the Grossmont Hills League season will be conducted in a series of three-game sets to be contested over one week. With such a deep league offensively, the season could end up being decided by the one stand-alone games the four teams will play against one another. The games over one week will be a test of pitching depth, but the clubs can likely use their aces a second time in the single contest. 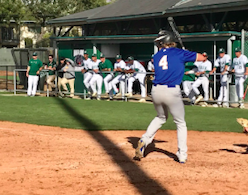 Either way, the first of a four-game, regular-season series between historic neighborhood rivals Grossmont and Helix got underway on Friday following a 2-day delay, and the first round went to the Foothillers. 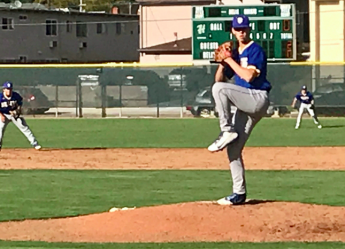 Grossmont pitcher Jack Hyde carried a 3-hit shutout through six innings Friday (Mar. 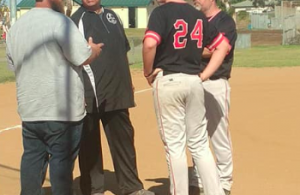 22), then barely held on in the 7th, pitching on fumes to produce a 3-1 triumph over the Highlanders in both ballclubs’ Grossmont Hills League opener. Some thought went into trying to play Game 1 as scheduled on Wednesday, but, in anticipation of rain in the area, the game was postponed. However, the harder rain hit later in the day. As for the ballgame on Wednesday, Helix had a hard time hitting Hyde, advancing only one runner to third base until the decisive final inning. A series of singles by Noah Lane, Devin Baker and Jack Sothras loaded the bases, with the potential game-tying runner on first base with one out. However, Hyde’s defense elected to throw to second base in an attempted to convert a game-ending double play. However, Eric Smelko was safe at first with an RBI on the fielder’s choice to avert the shutout. Hyde then took matters into his own arm, utilizing a 3-pitch strikeout, his 8th, to cap the victory. “Actually, it was my slider that was getting them today,” Hyde said. “I only started throwing my changeup in the last one or two innings to keep them more off balance. “My location wasn’t as good as I normal but my stuff was really good today and helped me get out of trouble and to challenge the hitters. “I did try to throw it by them every once and a while but I mostly focused on trying to get them to hit into outs, and if I got to 0-2 then I would go for the strikeout. Grossmont pieced together single runs in the 2nd, 3rd and 5th to mount a 3-run cushion. In the 2nd, a two-out tally saw a set of walks to Kaleb Tedokon and Brandon Smith, then James Odom followed with a line single up the middle. Tedokon scored, but Smith was nailed at the plate on a perfect relay from Lane the centerfielder, to shortstop Brandon Thompson, to Smelko the catcher to end the inning. 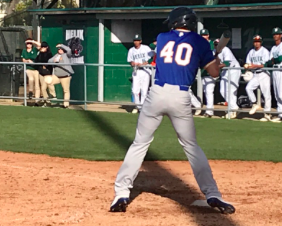 An inning later, Isaiah Gomez singled with one out, Giovanni Giganti walked, then with two outs, Keoni Valdez grounded the ball through the left side for the run. Valdez, Grossmont’s center fielder, also drove in a run with another two-out hit in the 5th. “Richardson was throwing hard so my mindset was, ‘if I’m on time with his fastball I won’t be late on the curve,’ and I feel like that really helps me when I’m facing someone throwing hard. “Jack did an awesome job on mound that kept us going through the whole game. Hiller No. 9 hitter Austin Wittmayer led off with a single. Two outs later, Brodie Romero was hit by a pitch, setting up Valdez on another run-scoring grounder to left field. Helix starting pitcher Alonzo Richardson allowed just six hits, yet was hurt by three walks in his five innings. 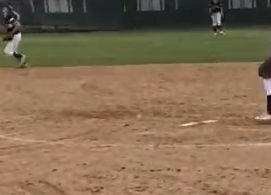 Thompson fired the final two frames, retiring all six Grossmont batters. In addition, Smelko went 2-for-3 with a double for Helix (4-6 overall, 0-1 GHL). “Jack Hyde is legit,” Smelko said. “USD is very lucky to get a pitcher like him. His changeup was really good, the slider was nasty and has great movement. He located his fastball and did a very good job of keeping us off balance. Grossmont (8-4, 1-0 GHL) is tied for first with Santana, which upended Granite Hills earlier in the week. Sothras had a hit and walked once for Helix. “Today was a tough game,” Sothras said “(Hyde) had his secondary pitches working great for him, he got us to chase his slider and changeup in the dirt, and they got three big hits early in the game. ← Previous Story Dons finally figure out East squad; other games, ppd.